If it's fake, don't put it on top of your cake! A 'loot box' is a box that is used to contain party favors, the small 'giving back' gift usually recieved by guests at a birthday. There is no known official equivelent of this. This is just a thin card box with the 'custom' image printed on it. It comes flat, and then is folded into shape. Here's a terrible fake costume with a mascot-like head. Too bad they did such a lame job with it. You can see the head to this costume on another page of bootlegs (it's facing front). 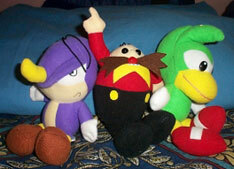 When their wiggly mouth un-Sonic-like head didn't sell, they clapped together a shabby, wrinkly costume to go with it. 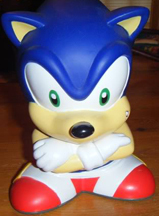 Notice, they weren't even paying enough attention to add his spikes! (or shoe buckles) Now they're stuck with a giant stupid head and a wrinkly costume because it wont sell! Discovered by Surferbrg. This is an odd fake! Usually if someone's going to rip off something, they only rip off one thing at a time. 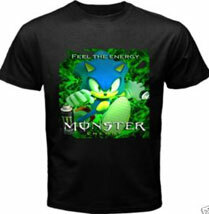 However, this shirt abuses both Sonic & "Monster Energy Drinks" by combining the 2 into a nasty hot-green fusion of foolishness! Why? Who knows! Someone has taken a screen of running-foreward Sonic, stained the whole thing hot green and thrown the 'Monster' logo at the bottom along with a can. 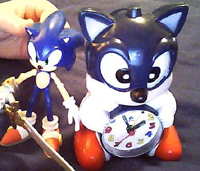 (Is that a can photoshopped into Sonic's hand too?) The top says "Feel The Energy" but all this shirt does is feel the phony! Who can be sure why they thought combining 2 ripped off properties would bring in more money...but here's the shirt for you to be sure to NOT buy. This hasn't proved to be real or fake yet. Do you know for sure with proof? Write in to clear it up! This has several features working for, and against it...so what'll it be? This is a dual purpose item. It's a key strap & screen cleaner. The back of the charm can be used (it is spongey and soft) to clean screens. More fake party stuff is never a surprise, since party items are throw-aways the bootleggers think it's ok to do a super cheap job. 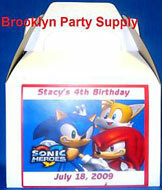 Here, you can see some boring cups with a stolen Sonic art slapped on there, party noise-makers with more simple print out art, and some character stand-ups. 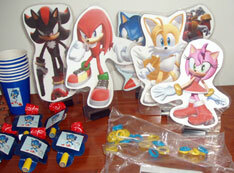 Notice the mixed up art from several games and lack of "Sega" anywhere. 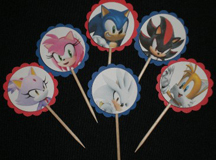 Plus, Shadow looks out of place there at a party for little kids...he's shown out strolling with his Glock or whatever--so much for the mood! But the bootleggers don't care, they'll put the easiest art they can find to make a buck. Discovered by Sonic Boy 19. What is this festival of fakeness? 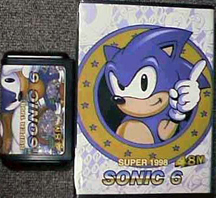 It's all the material for "Sonic Jam 6" or "Super 1998 Sonic 6" Bootleggers usually realease more than 1 art for an item, in order to keep fooling people into picking it up, and this has at least 3 different boxes for the same thing! With mish-mashes of mixed up art, bizzarre non-sensical titles "Super 1998"? and a shoe-horned in '6' its obvious this thing's a phony. But what is it like? Someone edited Sonic into a slightly upgraded (?) version of Super Mario, and he's red when you have no mushroom (instead of being small, that must have been too hard!) and blue when you do (as seen in the shots below). What an odd thing to think to do? Photos by SonicRetro. 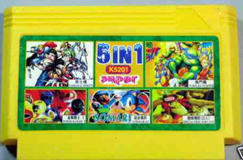 As you can see here from its cartridge, it came as part of one of those sure-to-be-fake "5 in 1" collections. They're hoping you'll think at least 1 game will be fun, and spend the money, but this is hardly the case! The whole point of Sonic 1 was to go fast, which the 8 bit cannot handle, and neither can Mario. It is sure to be an awful knockoff without much fun value. Fortunately, it is unlikely that anyone could be tricked into buying this. Photo & screens discovered by Berzerker. 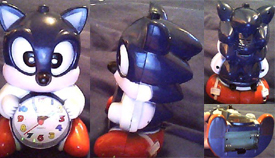 nor is it accurate, with white shoe buckles, blue inside the ears, and 2 separate eyes. With big lines down the sides, it doesn't seem that well put together either. You can watch/hear it in action on Fake Clock On Youtube, but it is a company video and they'll argue with you if you say it's fake. Photographed & owned by Berzerker. 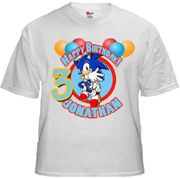 There have been a rash of these irritating phony shirts popping up in 2010. Here's another bogus bank, but it's been 'modernized' to have the SA style green eyes, in hopes of tricking people into thinking it's better. (it's not) It resembles an 'improved' version of the clock seen above, and also the plain bank before it. Why they keep on deciding to make it look so odd by not giving it a body is a puzzle. There are no copyrights or 'Sega' stamps anywhere on it. The sellers are argumentative as well, they'll fight with you on ebay or in comments if you try to say anything against the item. The best way to lame up a birthday party? 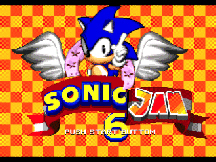 Add bogus Sonic junk to it! At left is a very-overly-colorful 'edible art cake print', and at right are some phony cupcake toppers. 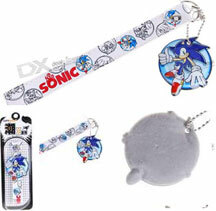 Sonic DX is years old, why would you want something so out of date? Bootleggers don't care! 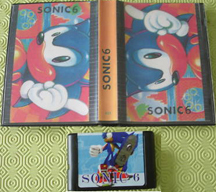 This is yet another bootleg NES cart where they tried (and didn't really succeede) at 'porting' a Sonic game. 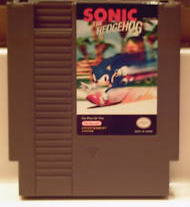 Remember, Sonic's earliest game was 16 bit, and the NES was only 8. 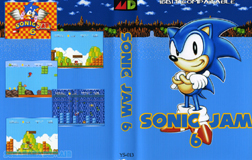 This one is a bit more of a modern attempt at it though, as you can tell from the Sonic Jam art, mashed in with the old logo.